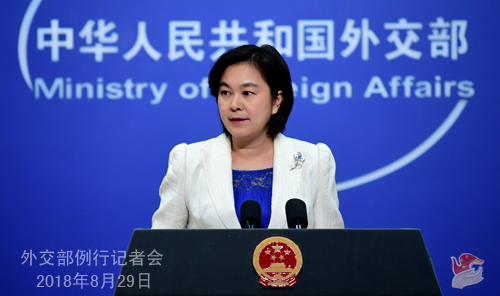 The 7th Ministerial Meeting of the Forum on China-Africa Cooperation (FOCAC) will be held in Beijing on September 2. State Councilor and Foreign Minister Wang Yi and Minister of Commerce Zhong Shan will co-host the meeting with the Minister of International Relations and Cooperation and the Minister of Trade and Industry of South Africa, the co-chair of the FOCAC. Ministers or representatives responsible for foreign and economic cooperation affairs from other 53 African member states will be attending the meeting. The meeting is set primarily to prepare for the the 2018 FOCAC Beijing Summit to be held on September 3 to 4. The meeting will assess the implementation of the outcomes of the 2015 Johannesburg Summit and review and approve the drafts of the agenda and outcome documents to be submitted to the Beijing Summit. The 7th Ministerial Meeting of the FOCAC is an important institutional meeting of the forum and a key preparatory meeting for the Beijing Summit, an occasion to make the final preparations for the summit. We are convinced that with the concerted efforts of China and Africa, this ministerial meeting will smoothly accomplish its tasks and missions, making positive contributions to the success of the summit. Q: The Security Council recently held a meeting on the situation in Myanmar. The UN-backed fact-finding mission said top Myanmar military generals must be prosecuted on the charge of "ethnic cleansing"for the Rohingya issue. What is China's take on this issue? What role is China going to play? A: I took similar questions yesterday. The Rakhine issue has a complex historical, ethnic and religious background, which calls for proper settlement by Myanmar and Bangladesh through bilateral negotiations. Both Myanmar and Bangladesh are China's friendly neighbors, and China has been working on the two countries to help them resolve the Rakhine issue through talks. In June, State Councilor and Foreign Minister Wang Yi held an informal meeting with the visiting Bangladesh's Foreign Minister Abul Hassan Mahmood Ali and Myanmar's Union Minister for the State Counsellor's Office U Kyaw Tint Swe, and they reached four-point principled common understandings. They agreed to continue to follow the three-phased solution of "cessation of violence, repatriation and development", improve the situation in the Rakhine state at an early date and seek proper settlement through bilateral negotiations between Myanmar and Bangladesh on this basis. The most pressing task at this point is the repatriation of the people taking shelter in Bangladesh, and concrete measures and substantial steps must be taken as soon as possible to repatriate the first batch of people. China is ready to provide further assistance to improve the living and sheltering conditions of those displaced in accordance with the will of Myanmar and Bangladesh, leverage our respective strengths to bolster the development cooperation in the border areas of Myanmar and Bangladesh to earnestly improve the livelihood locally. China is now working more closely with the two countries to follow through on the above-mentioned principled common understandings. China also sent Sun Guoxiang, Special Envoy of Asian Affairs of the Ministry of Foreign Affairs, to visit Myanmar and Bangladesh several times to conduct in-depth communication on the Rakhine issue, help the two sides build mutual trust and resolve the Rakhine issue through bilateral channels. Under the current circumstances, the international community should cherish the hard-won progress all the more, remain patient and continue to play a constructive role in promoting the dialogue between Myanmar and Bangladesh and advance the solution of practical issues. Q: The ROK military said a Chinese military aircraft entered the ROK's Air Defense Identification Zone (ADIZ) this morning, and the ROK side scrambled fighter jets in response. What's your comment? A: I'm not aware of the relevant situation and will refer you to the Defense Ministry. But you must be aware that the ADIZ is not equivalent to territorial air space. Q: US officials said that China has hacked Hilary Clinton's emails. Can you tell us if this is true or is this the US domestic political games? A: It is not the first time that we were accused of such things. I would like to know your opinion on this. Cyber security is a global issue concerning the interests of all countries and must be protected by the international community. Anyone who truly cares about this issue will not forget the PRISM program, the "Equation Group", and the WannaCry ransomware ravaging computer systems around the world which was set off by some country busy designing aggressive cyber tools. China is a staunch champion of cyber security and firmly opposes and cracks down on all forms of cyber attacks and espionage activities. 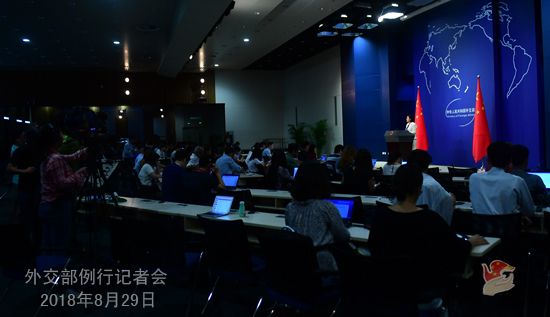 China believes that the international community should jointly address threats to cyber security through dialogue and cooperation on the basis of mutual respect, equality and mutual benefit. Q: The US Department of State released a statement on August 27, announcing the US sanctions against Russia over the poisoning of a former spy in the United Kingdom went into effect the same day. Following that, Russia said it rejects a new round of confrontational, illegal and unjust sanctions by the US, and will take equivalent measures in response. What's your comment? A: China always opposes the wanton use of unilateral sanction or threatening to do so in international relations. Such act will not help resolve problems at all. Both Russia and the US are influential major countries in the world and permanent members of the UN Security Council, who assume important responsibilities for world peace and security. We hope Russia and the US will properly resolve relevant differences through talks on the basis of equality and mutual respect and in accordance with universally recognized principles of international law. Q: Reports say that the US suspended Mike Pompeo's visit due to a letter it received from the DPRK, in which the DPRK said the US is still not ready to meet its expectations in terms of taking a step forward to sign a peace treaty. The DPRK felt that the denuclearization process could not move forward and the talks were again at stake and may fall apart. What's your comment? A: To realize the denuclearization and lasting peace of the Korean Peninsula serves the common interests of all relevant parties and accords with the shared aspirations of the international community. 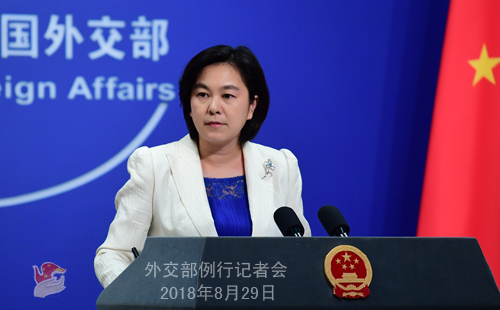 In order to address the crux of the Korean Peninsula issue, China maintains that the denuclearization and the establishment of the peace mechanism of the Peninsula should be advanced in a coordinated manner. Under the current circumstances, relevant parties, the DPRK and the US in particular, should stick to the right direction of political settlement, maintain the momentum for dialogue, work together to show more goodwill and sincerity to each other, and do more to help enhance mutual trust, so as to make joint efforts to move forward the process of the political settlement of the Korean Peninsula nuclear issue. Q: Reports said that China has started building a military base in Wakhan corridor in Afghanistan. Can you confirm that? Why is China building a military training base in Afghanistan? Can you confirm how many troops China will send to Afghanistan when this is completed? A: We have checked on this report and it is not true. Q: Philippine Finance Secretary Carlos Dominguez said in an interview on August 28 that the China-proposed Belt and Road Initiative is a powerful idea which could really be an engine for global growth. The Philippine government is promoting the Build, Build, Build infrastructure program, thus ready to strengthen its cooperation with China on infrastructure within the framework of the Belt and Road. What's your comment? A: We applaud Finance Secretary Carlos Dominguez's positive remarks. Not long ago, Finance Secretary Carlos Dominguez headed the economic team of the Philippine cabinet to visit China, having a good meeting with State Councilor Wang Yi and talks with officials of relevant departments and reaching many consensuses on advancing the practical cooperation across the board between the two sides. The Philippines is China's friendly close neighbor and an important partner for the building of the Belt and Road. China values its relations with the Philippines and is ready to continue to work with the Philippine side to enhance strategic synergy, bring more benefits to the two peoples and promote our common development. Q: US Defense Secretary said that the US military has no intention of suspending more US-ROK joint military drills. What is your comment? Do you think this may run counter to the suspension-for-suspension proposal China has been advocating? A: Do you think that it meets the interests and aspirations of the ROK side if the US and the ROK does not suspend joint military drills? Not long ago, thanks to the concerted efforts of all relevant parties, the situation on the Korean Peninsula has been improving, demonstrating a good momentum. This outcome is hard-won. The political settlement of the Peninsula issue is facing an important opportunity. The relevant parties should stay on the right track of seeking a political settlement, positively engage with each other for more talks, accommodate each other's legitimate concerns, show more sincerity, good faith and flexibility, and accumulate mutual trust. They also need to act on the important consensuses reached during the DPRK-US and DPRK-ROK summits, and work together to promote denuclearization and the political settlement. This would be the best way to serve the common interests of the relevant parties.